Looking back at the third edition of The Plastics Show NPE in Orlando EAS is very pleased with the results! Not only did we meet many interested visitors and were we able to demonstrate our solutions for a constant flow of people, but returning to our offices, we started work on the follow-up of all contacts and have already written multiple orders for the displayed products. 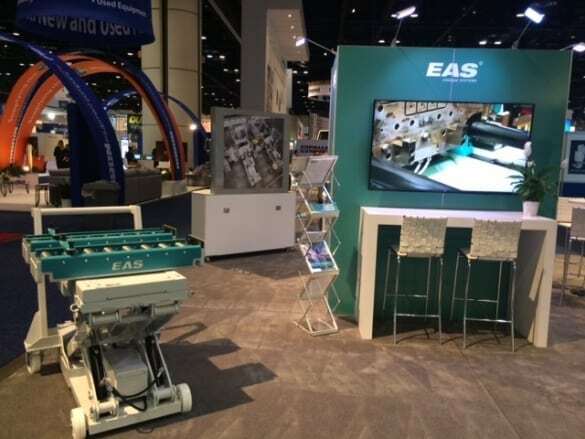 EAS develops, produces and sells components and turnkey systems for quick tool changes on plastic injection molding machines as well as on presses, stamping and die casting machines. We supply components as well as full and semi-automatic systems for injection molding machines of all ages, sizes and manufacturers. From globally known brands to local machines, with clamping forces varying from 500 kN to 55,000 kN. One of the key exhibits was the small mold cart. The easy loading of a tool, without manual labor was appreciated by many visitors. The loading height of the mold cart is adjusted effortlessly and, docked onto the IMM, a push/pull arm loads the tool automatically into the machine. It provides a rapid and efficient way of converting a manufacturing process from running the current product to running the next product. Besides the wide range of solutions for mold change systems, ejector couplers and multi couplers, we also displayed our mold care program at the NPE trade show. The longevity of tools is ever higher in demand and we noticed a lot of interest for that specific part of our exhibits: our mold care program. The EAS mold care program helps advise and support our customers in their endeavor to introduce tools in the best technically optimal condition into production – a must for automated systems and a necessity for all injection molders. Well maintained molds offer a longer lifespan and smoother change-overs. The EAS mold care program covers mold handling from storage to transport on site to loading and unloading of the machine. Automated and carefully guarded, the solutions range from mold change tables, inspection and maintenance units to pre-heating equipment. All to reduce manual operations, thus offering safer working conditions benefitting personnel as well as the tools. The next international exhibition for the plastics industry, the Fakuma exhibition, will be held in Friedrichshafen, Germany. From the 16th till the 20th of October EAS will be presenting their products and automated solutions for a worldwide audience. “We expect that the Fakuma, just like the NPE will show a growing number of visitors. Automating solutions are in high demand, and we offer surprising ways to minimize down time and maximize efficiency as well as safety,” says Manuhutu.